The contact fingers indicate a winning combination and the motor starts operating. One of the posts (see below) starts to move the ratchet as the slicer is cutting off coins. 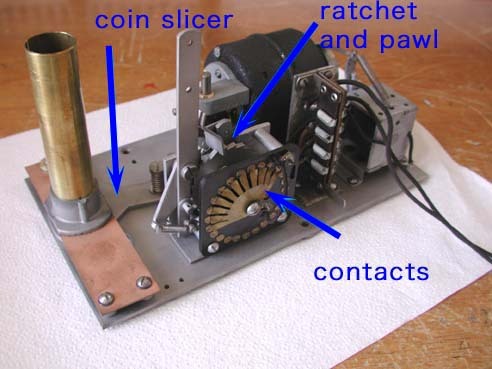 The ratchet is being pulled back as the coin slicer continues its back and forth movement. The motor continues to turn. The ratchet has engaged the next tooth. Note the contact fingers still have not moved and are continuing to provide power to the motor. As the ratchet pulls the next tooth into position, the contact fingers rotate and remove power from the motor. Note the number of fingers determines the amount of the payout. This is the opposite side of the mechanism. Note the vertical shaft turned by the screw gear. The wheel at the bottom of the vertical shaft has two posts which activate the ratchet lever as they pass by it. The same wheel also has an ecentric that wig-wags the coin slicer. Coins are stacked in the brass tube after being played.